This is just going to be a quickie fashion post. I know a lot of you petite girls keep asking about how it is that I make myself look taller than my GIGANTIC 4'10.5" stature. The truth? As much as I love how platform heels make my legs look longer, it just isn't reasonable for wearing to work everyday. Proportion is the real key. I know I've said it so many times, but it's simply the truth. Proportions can trick the eye to see more flattering or unflattering body shapes. I'm using a couple of recent outfits as an example. (Please excuse the very messy bathroom, by the way.) Here I chose to make my flashy liquid leggings look more wearable with a feminine tunic (worn dress-style for me) and a long open cardigan. The "dress" nips in at the natural waist and also creates a shorter torso proportion, giving the appearance of having longer legs. Lacey detailing at the neck draws your eyes to your face so the flashy leggings don't compete as loudly. The leggings also go down to the ankle so there aren't any extra lines cutting the leg line shorter from, say, calf-length leggings. Sturdy heels give an extra couple inches too, but they aren't too high to be uncomfortable. The second outfit showcases another beloved oversized-tee. I tucked the top into my high-waisted denim pencil skirt to help define the waist. The puffy top doesn't hurt in the bust department either, and gives a more hourglass-shape illusion. The cropped cardigan further accentuates the high waist-line and makes the bottom half of the body seem longer. These shoes only have a 2" heel but seem taller because it is low-cut at the toe. There are no ankle straps to cut the leg line. Without the cardigan, the look still works but is probably best for those with narrow shoulders. A big chested woman might look top heavy with this look! Hope that helps a couple of you shorties (or anyone) dress with your proportions in mind. You know where to leave any other fashion questions: comments, comments, comments! Oh, and don't forget. The Mineral Magic Cosmetics giveaway is still going on! Enter and get nice things for free! Great post!! Thanks for the tips. and you look gorgeous as always!! There used to be at least two more monolid beauty bloggers out there (Tiffany Kei and Mulzanza) but they've both moved on and disappeared off the blogosphere, leaving very few in number. So, I guess my request for you is a monolid smoky eye look :) There are not enough monolid beauty tips out there and you're so good at doing tuts and stuff. Girls would be thanking you with tears of gratitude!! Love your tips - I had never considered that about long v. 3/4 leggings before! Picnicbasket: OMG, I love boots. I absolutely wear them almost all the time from Fall-early Spring. Some of my favorites are knee-high suede! I wear my black Minnetonka moccasin knee-high boots all year 'round. oh jen, you dress so nice! and its affordable clothes! 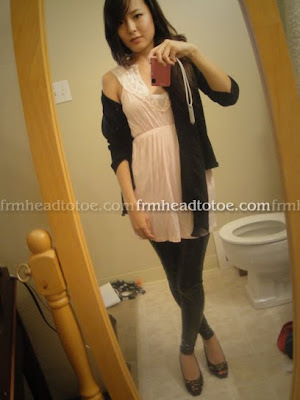 thank you so much for your tips, im short too but i wish i could pull of this look but i cant because im fat =/ and leggings on me would look so bad...i always wanted to wear them but yeah my legs would look terrible. im still very thankful for these wonderful tips! am loving your style! even I feel like I could never pull it off! I need help for this fall! what main essentials should I invest in? Picnicbasket: It's because I believe it's more important to not break the leg line and "look" longer than to actually be taller in height. If you are physically taller but have belt lines, shoe lines, and pant lines breaking up the visual length of the body you will still look less attractive than dressing well-proportioned and having flat shoes. I hope that makes sense! You're looking fabulous in this dress!! Denim skirt is looking outstanding! !